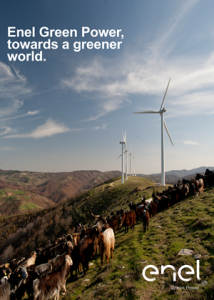 Enel Green Power is present in Greece with 308 MW of installed wind capacity, hydro and solar power. Enel Green Power Hellas is also responsible for two wind parks in Bulgaria of total installed capacity of 42 MW, as well as a series of photovoltaic stations and wind parks in Romania of total installed capacity of 534 MW. Enel Green Power Hellas incorporates in its strategy and business practices the principles of sustainable development and corporate social responsibility, placing the outmost emphasis on safety at work, as well as contributing to the well being of its employees and the neighboring local communities. “We want to lead the transition towards a more sustainable and environmentally friendly future building on the foundations of safety, operational excellence and innovation, respecting ethics, embracing diversity and contributing to the well-being of our employees and surrounding communities”. ΕΠΩΝΥΜΙΑ ΟΡΓΑΝΙΣΜΟΥ: Enel Green Power Hellas A.E. Enel Green Power is the Enel Group company fully dedicated to the international development and management of renewable energy sources, with operations in Europe, the Americas, Africa and Asia. With an installed capacity of over 35GW and more than 710 plants in 16 countries, the mix of generation that includes the main renewable sources: wind, solar, hydro, geothermal and biomass. 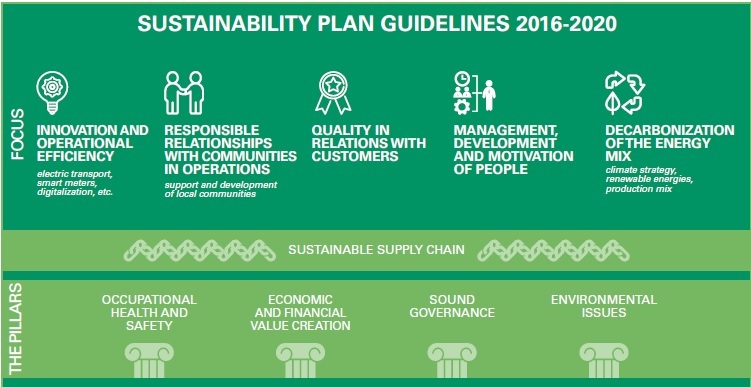 Sustainability is an integral part of our way of doing business, and drives us to constantly seek out new solutions to reduce the environmental impact of our activities, to grow together with the communities of which we are part, to increase the safety of our colleagues and our suppliers. Listening to and actively involving all stakeholders, together with rational use of resources, enable the promotion of synergy between economic and social progress. The effectiveness and the efficiency of business processes, during both development and operations, are heavily dependent on stable and constructive relations with the various stakeholders and the ability to fit synergically into local areas, preventing and managing social and environmental impacts. In order to respond promptly to changes at the Company, it is increasingly necessary to open up to external inputs. For this reason, Enel has promoted the “Open Innovability” model, activating an increasing number of partnerships worldwide with local organizations, businesses, universities, international associations and NGOs. This is a model which promotes sustainable development fully in line with the indications of the United Nations Global Compact, of which Enel has been an active member since 2004 and which reiterates the importance of greater integration of sustainability into companies’ strategic choices. take action for carbon free energy by 2050 (SDG 13, CLIMATE ACTION). cyber security, which represents an essential element in the digital transformation plan. Enel has developed a strategy aimed at protecting information, assets and emerging technologies (for example IoT). the paradigmatic change in the world of energy and the transformation in utilities’ business model. New macroeconomic and energy trends, technologies and key players can potentially support and disintermediate the traditional business model of utilities, in particular the combination of factors linked to digitalization and decentralization and changes in customer needs. Enel Green Power Hellas identified the issues using the Materiality tools created from the Group’s Sustainability Department. The identification is based on the analysis of internal and external sources and takes into consideration the different geographical situations, the developments in the sector and the corporate processes. The analysis shows broad alignment between what stakeholders are asking for and the priorities attributed by the Company to the different issues in relation to its business. Business and governance issues: Enel Green Power’s strategy aims at a sustainable business model based on industrial growth focused on renewables. Social issues: the main focus is on people’s health and safety, an issue that the Group has been carefully monitored for a long time and which continues to be one of the key priorities for the Company. Responsible relationships with communities is becoming increasingly important confirming Enel Green Power’s decision to focus on creating shared value. Environmental issues: climate change strategy is the main element of interest for the Company and is aligned with the expectations of stakeholders, as shown by Enel’s long-term strategy and the commitment to achieve carbon neutrality in 2050. Renewables are the energy source which is growing most strongly, while the others are stable or falling slightly. So it is increasingly important for Enel Green Power Hellas not only to be aware of and anticipate technological developments, but also what society around us wants, thus ensuring that communities understand and share the strategy and investments which a large group such as Enel can provide. Enel Green Power Hellas fully aligned with the Group priorities focuses on the United Nations Sustainable Development Goals (SDGs), which are an integral part of the Strategic Plan. Underpinning its work the Enel Group has a solid system of ethics. Enel Green Power is in line with the afore mention system. This system is a dynamic collection of rules which is constantly oriented at introducing the best international practices which all the people who work in Enel and for Enel must comply with and apply in their daily work. The activity of Enel Green Power Hellas (EGPH) confronts with the Group’s culture and operation. EGPH collects and provides the required local data to the Group. Enel’s Sustainability Report is based on materiality analysis, which enables assessment of whether the company’s strategic positioning is aligned with the stakeholder expectations regarding sustainability issues. Enel is deeply committed to transparent and accurate sustainability reporting principles and the Report meets GRI requirements for reporting, in line with the GRIs Sustainability Reporting Guidelines. To improve the monitoring of sustainability performance, Enel’s reporting is based on the GRI G4 Guidelines, Core in accordance option, as well as the G4 Electric Utilities Sector Disclosures, which highlights the specific features of the electricity industry. Enel contributes to the achievement of four of the UNs Sustainable Development Goals and to be one of the world’s first companies to have integrated these targets into our sustainability strategy and reporting processes, which is proof of our commitment. This reinforces the belief in the open approach undertaken by the Group to help change the way companies in the sector pursue their business objectives. 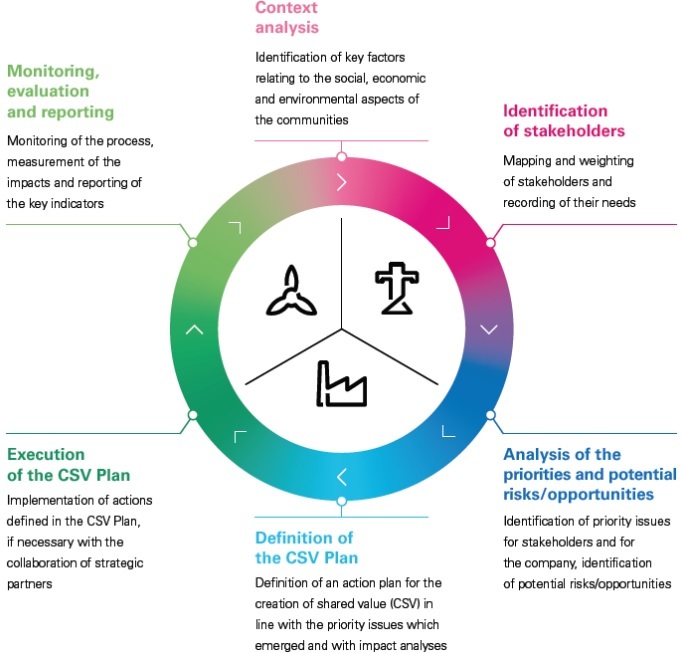 The afore mentioned Standard is embedded in EGP CSV (Creating Shared Value) model to the business and provides support to the company for sustainable choices and approaches in project development, design, construction and operation, focusing on protection the environment, rational use of resources, attention to health and safety, innovation, circular economy and to stakeholder interests. Via this Standard metrics and criteria provided to carry out constant assessment and monitoring of the work undertaken so as to generate continuous improvement mechanisms. During the Construction phase some KPIs will be used to measure the seven Sustainable Aspects (People/Territory/Safety, Emissions/Climate, Energy, Materials, Water, Waste, Biodiversity) that will be linked to 17 Sustainable Development Goals of the United Nations to the Indicators of G4 Guidelines issued by the Global Sustainability Standards. These aspects contain economic, environmental and social performance. Enel Green Power Hellas (EGPH) integrates sustainability into all aspects of the business, in order to constantly seek out new solutions to reduce environmental impact, to satisfy the needs of local communities. From the definition of strategic guidelines to business development, to the stage of engineering and building a plant, up to its daily operation, the way of operating adds and creates shared and inclusive value in the medium to long term. EGPH operates based on the CSV internal model, an internal sustainable development plan. Via the CSV approach we bring together the company’s perspective and the social, economic and environmental needs of the community in which the company operates in order to identify choices that create value for both parties. The contributions of the main Group companies involved in the process are taken into consideration in the overall matrix for the Group on the basis of the importance of these companies in relation to the type of business they operate in. Understanding the expectations of stakeholders, through continuous and structured dialogue, is at the heart of the company’s strategy. 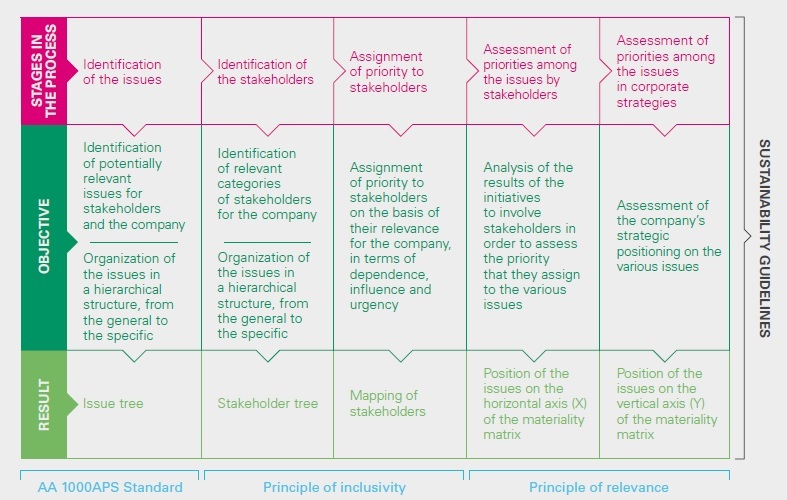 The stakeholder categories identified (financial community, institutions, business community, civil society and local communities, suppliers and contractors, employees, the media) are assessed and weighted in relation to the following parameters: dependence (in the sense of the importance of the relationship for the stakeholder), influence (importance of the relationship for the Company) and urgency (temporal aspect of the relationship). The interaction with stakeholders takes place through numerous initiatives to involve them, with different methods depending on the communication channel (general, specific, and participatory channels), the type of relationship with the company concerned, the frequency of interaction and the reference context. For example the day-conference against the illegal use of poisoned baits that has been organized from the Managing Body of the Dadia-Lefkimi-Soufli Forest National Park and Enel Green Power Hellas presents the cooperation between the local community and EGPH. The conference dedicated on the ways to deal with the illegal use of poisoned baits, and has been held on December 8th at the Conference Room of the Managing Body at Dadia Forest National Park. Enel Green Power Hellas (EGPH) does not operate in the retail market and does not have products with the typical meaning of the word, since it is a producer of energy from Renewable Energy Sources. However, in all its activities in the plants it operates all over Greece, it seeks to implement sustainable projects in parallel to the operation of its plants. Συννημένα Αρχεία: Λήψη "In house snow removals" Λήψη "Weed management by the use of sheep"
Enel’s strategy to reduce energy consumption, envisages investments to increase efficiency in all the Group’s activities, from production to distribution, and also aims at disseminating greater awareness on energy use. There is no CO2 emissions produced by Enel Green Power Hellas renewable energy plants. Enel Green Power’s success goes hand in hand with the fulfilment of a new development model that is more respectful of the environment and is on a human scale. It stems from the daily success of the over 4,500 people working with us around the world. Enel Green Power Hellas has 113 employees, 36 women and 77 men. Climate Survey: every 4 years an anonymous survey is completed by the employees regarding their working environment their boss, the company etc. “At the base of our work is the sharing of the basic values of trust, responsibility, innovation and proactivity”. The average hours of training per year per employee is 110,4 hours. The Policy “Classification, Communication, Analysis and Reporting of Incidents” defines the roles and the ways to guarantee the timely communication of accidental events and to ensure root cause analysis, the definition of improvement plans and their monitoring. The policy details communication and investigation modalities for events such as “near misses”, that could have resulted in severe injuries. From November 14 to 20, 2016 there was the eighth edition of the International Health and Safety Week, providing for all workers a moment to reflect on health and safety themes. Events were held involving both contractors and Enel employees, for a total of 72 thousand people. The communication and support campaign entitled “Let’s Pay Attention” aimed to reinforce the importance of the collaboration and involvement of all individuals, regardless of hierarchies and roles. Also in 2016 the information campaign on road safety continued, focusing on the main causes of accidents. The people who work in Enel responded to a quiz in 7 languages and were invited to share their personal experiences through a dedicated section on the company intranet. Enel Green Power Hellas bases its purchasing processes on pre-contractual and contractual conduct which is focused on reciprocal loyalty, transparency and collaboration, in order to have a resilient and responsible supply chain. In 2016, the Company fully in line with the Group adopted the new operating practices that were established and implemented regarding checks on the “Requirements of good standing” aimed at consolidating the existing control system through more incisive action to contrast corruption. Also, the Sustainable Supply Chain Project continued, which was launched in 2015 and aims to standardize across the whole scope of the Enel Group the criteria for monitoring companies from the viewpoint of their environmental impact, safety, and respect of human rights. The project aims to strengthen the Group’s positioning regarding the supply chain and valorize the Company’s key role in the process of changing and innovating its suppliers. In particular in 2016 the sustainability requirements were defined which will become obligatory during 2017, which the supplier must satisfy to be included in the Enel Register of Approved Companies. These requirements are broken down into three different sections for which the supplier must provide information and documentation linked to safety, environmental and human rights aspects. The supplier will be selected and constantly monitored also on issues such as: inclusion and diversity; the protection and privacy of workers, and verifying its own supply chain on issues linked to forced labor/child labor. The supplier approval process requires, also in compliance with the law in force, the presentation of a series of documents and, among other things, the adhesion to the principles expressed in the Code of Ethics, the Zero Tolerance of Corruption Plan and the 231 Compliance Program, the Policy on Human Rights, and the ten principles of the Global Compact with specific reference to the absence of any conflict of interests. All approved suppliers are requested, to provide specific documentation certifying they are up to date with the payment of social security contributions. In particular, the questionnaire regarding human rights, is designed in accordance with the indications of the internationally recognized principles contained in the UN’s “Guiding Principles on Business and Human Rights” and UNICEF’s “Children’s Rights and Business Principles”. Enel requires, among other things, its contractors and subcontractors to adhere to the ten principles of the UN Global Compact, the respect and protection of internationally recognized human rights, as well as respect of ethical and social obligations on combating child labor and protecting women, equality of treatment, a ban on discrimination, freedom of union membership, association and representation, forced labor, environmental safety and protection, hygiene and sanitary conditions and other regulatory, pay, social security, insurance and tax conditions. Contractual commitments are then envisaged for Enel’s contractors and subcontractors aimed at adopting conduct that is opposed to any form of corruption and extortion In order to guarantee respect of the aforementioned obligations and constantly check their fulfillment, Enel reserves the right to monitor and control its contractors and to terminate the contract in the case of violation. Enel Green Power Hellas contributes in a concrete way to the social and economic development and growth of the local areas and communities where it operates with various types of intervention, from expanding infrastructure to education and training programs, from initiatives aimed at social inclusion to projects to support the cultural life of the area. In 2015 Enel adopted a Creating Shared Value (CSV) model which integrates social and environmental factors into business processes and throughout the value chain. The dissemination of this model required a process of definition and consolidation within the company at both cultural and operational level. In 2016 Policy no. 211 “CSV Process definition and management” was published, which defines how sustainability must cut across company processes and be a shared responsibility. Through specific context analysis tools, the mapping of stakeholders and the definition of materiality matrices and action plans, the development of a business project is accompanied from the initial exploratory approaches to its final definition. These analyses, and in particular the materiality matrix of the site, enable the identification of short-, medium- and long-term actions which combine the corporate perspective with the needs of the local communities through concrete and acknowledged initiatives. This is all done while guaranteeing particular attention to identifying and protecting ancestral communities which are affected by projects, in compliance not only with Convention 169 of the International Labor Organization and local laws, but above all the respective traditions and cultures. has implemented PlayEnergy program to 200 students. PlayEnergy program is addressed to students of both the primary and secondary education. It is an international educational project by Enel which brings students, professors and parents together directly into the heart of energy. The Greek version of PlayEnergy, approved by the Hellenic Ministry of Education and Religious Affairs, aims at promoting awareness among the students on issues related to the environment and the Renewable Energy Sources (RES). In parallel, the youngsters have the opportunity to experience in an interactive way more about renewables and enrich their knowledge about power generation through technologies such as wind, solar, hydroelectric and geothermal.